The first thing that strikes you about this painting is the sheer size of it – it’s 12′ by 9′ (that’s over three and a half metres tall by nearly 3 metres wide). It was done to impress – you would have seen this at the end of a long gallery, dominating the space – and the horizon line is at the level of the horse’s stirrup, which means we’re looking up at the King. This is Charles I. He’s wearing armour – made at the Royal Armouries at Greenwich – and mounted on a huge horse. He’s carrying a baton, the traditional symbol of military command (think of Niccolo da Tolentino in the Uccello painting) and his servant on the right is about to hand the king a plumed helmet. Around his neck is a locket bearing the image of George and the Dragon, which identifies him as a Knight of the Order of the Garter. (Inside the locket was a portrait of his wife.) This then is the monarch as warrior king, effortlessly controlling his mount (and for that, read the nation), his eyes focussing on the future. This is Van Dyck giving us the king as the mighty ruler, the leader of the nation. Note that on the tree just above the servant is a plaque that reads in Latin “Charles, King of Great Britain”. 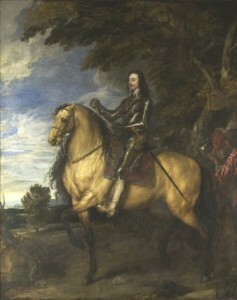 It emphasises Charles’s belief in his divine right to rule – the consequences of which led to the English Civil War and Charles’s eventual execution. It’s also a sleight of hand by the artist. Charles was only 5’ tall, so Van Dyck has created an image of the king that makes him seem bigger and more powerful than he was in real life. It’s little wonder that Van Dyck was the official court painter and had a virtual monopoly on these life size paintings of the King. Van Dyck was the most important Flemish painter of the 17th Century. He’d worked for Rubens in Antwerp, then he lived in Italy for six years where he studied the paintings of Titian and Veronese and developed their style of full-length portraits. Charles was a great patron of the arts and persuaded Van Dyck to come to London in 1632 – knighted him, gave him a pension and made him “Principal Painter in Ordinary to their Majesties”. Van Dyck’s popularity with the king also made him in great demand among the rest of the Court and the aristocracy and he had a thriving studio in Blackfriars turning out portraits – there are some other splendid examples in the National Gallery. The figures in his court paintings often seem melancholic, as Charles does here. Although Van Dyck died in 1641, the year before the Civil War broke out, it’s almost as if the subjects knew the fate that was awaiting them. On the 29 January 1649, Charles stepped out onto a scaffold in Whitehall, a couple of hundred metres away from the National Gallery, and was executed. He had with him the George and Dragon locket containing the portrait of his wife. This entry was posted in five minute presentations, National Gallery and tagged charles I, VAN DYCK on 20/07/2015 by donbrown.